Construction will begin later this year on the next phase of Ballpark Village, the development outside of the St. Louis Cardinals‘ Busch Stadium. Plans are in place to add to the existing Ballpark Village by undertaking a second phase of construction. 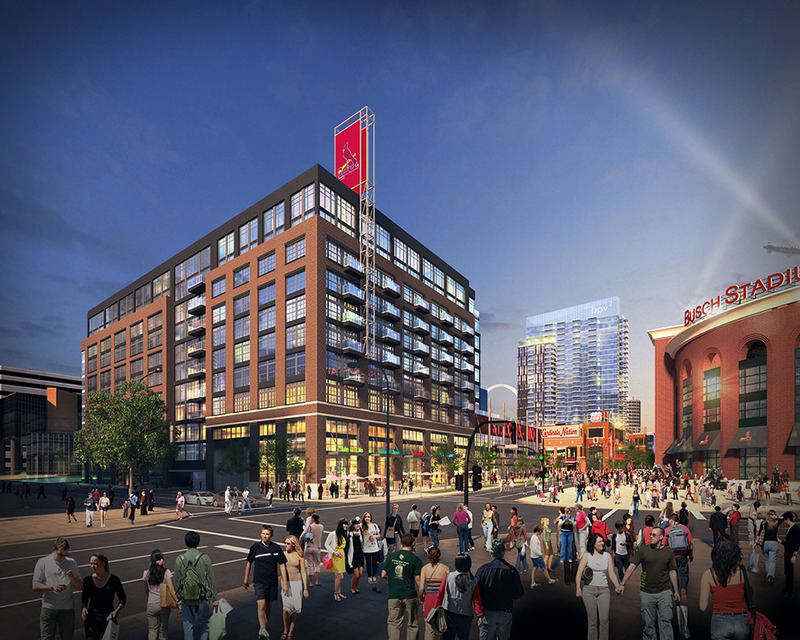 As a result of phase two of the development, Ballpark Village will be equipped with several new amenities, including a Class-A office building, residential units, retail, and entertainment areas. “Having a luxury apartment on the grounds of Busch Stadium basically is going to be a significant draw for many people across the country, not just in St. Louis,” said Missy Kelley, President & CEO of Downtown STL. The west side parking lot at the end of the current Busch II’s infield is set to grow upwards. “It will go from being a great entertainment spot to an actual village and an actual neighborhood where there will be retail and commercial development as well as a luxury residence,” said Kelley. As noted, the construction process will begin by the end of this year, and is expected to last about 18 months. Previous estimates have called for the second phase to be completed in 2019. Rendering courtesy St. Louis Cardinals.